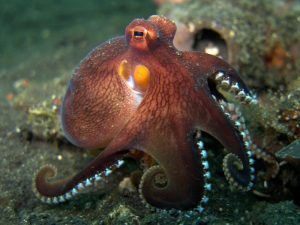 The coconut octopus, alternatively known as the veined octopus, is an intelligent cephalopod widespread in the Indo-Pacific tropical waters. It has derived the name from its tendency of carrying coconut or seashells as its armor. 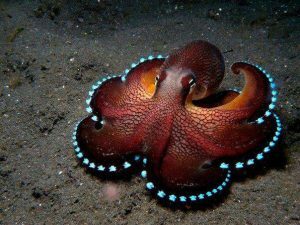 This medium sized octopus is not poisonous. Size: Their average length is 3 in (8 cm); including the tentacles, they are around 6 in long (15 cm). Weight: They weigh around 7-9 oz (200-250g). Color: Coconut octopuses have elegant physical characteristics marked by a brown colored body with vein-like lines paired with a yellow siphon. White and blue colored suckers create a perfect contrast to the dark colors observed on the edge of the arms. A trapezoidal shape area right under the eyes exhibits white shade. 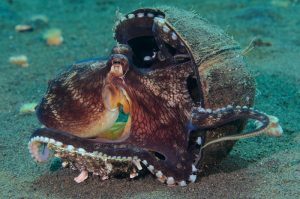 Coconut octopuses are commonly found throughout the tropical Pacific and the Indian Ocean, from Australia to South Africa, Southern Japan, New Guinea, Indonesia, and India. It is a benthic creature meaning it stays at a depth of around 600 ft (183 m) in a muddy and sandy surface. 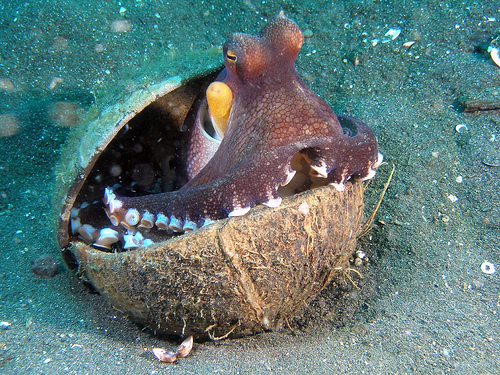 Coconut octopuses are solitary creatures, living alone throughout their life. They hunt at dusk and dawn. Most of the time, they hide their whole body except the eyes, inside the sands. 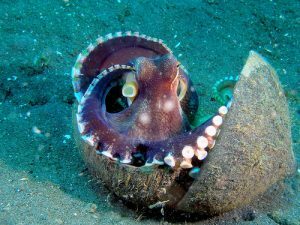 Female coconut octopuses are extremely protective of their eggs and release ink to their threats. These carnivores eat fish, shrimp, and crustaceans which they gather from the mud holes. 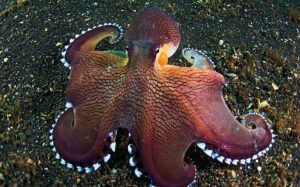 When the water gets warm, the male octopus passes the spermatophore with a hectocotylus (a tentacle) into the female’s mantle area. It is quite a risky affair for the males as females are prone to eat their counterparts during mating. So, males disguise themselves as females in order to have offspring. 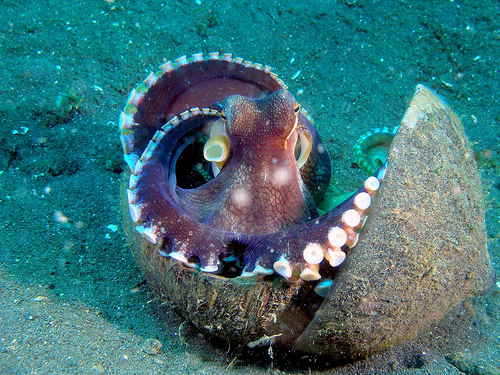 After a period of 11 months, a female coconut octopus lays up to 100,000 eggs, each sizing less than 0.24 in (6 mm). She keeps the eggs in a safe corner or crevice and protects them until they hatch. Offspring exist in planktonic form initially. After hatching, they are usually carried out by the sea current and feed on copepods (aquatic insects) during this period. At the age of 1-2 years, they attain sexual maturity. 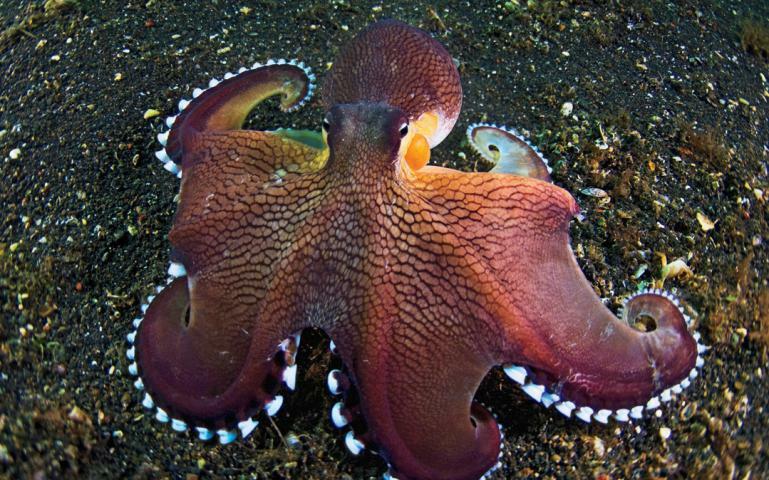 These octopuses live for around 3-5 years. They are capable of bipedal movements and slit walking which allows them to carry their concealment tools like coconut or clam shells with the other six tentacles. 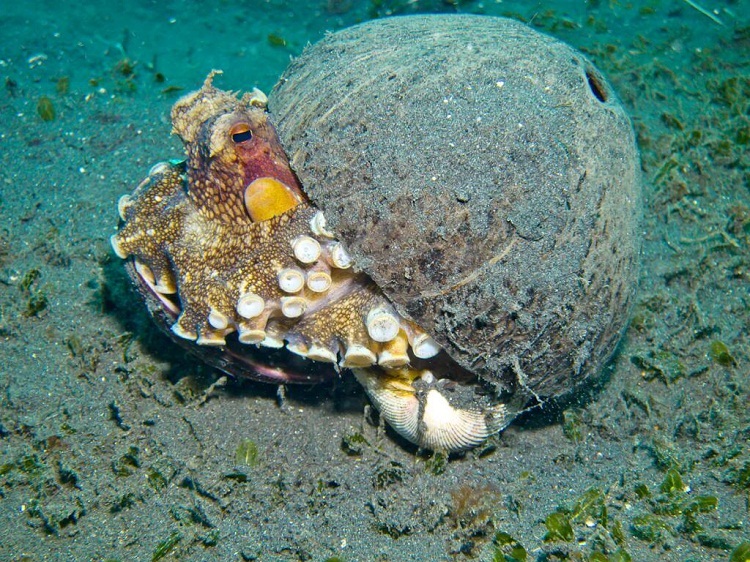 Due to the absence of exoskeleton, these octopuses easily fit into the shells and roll themselves. This makes them look like rolling coconuts and it deceives the predators. Their chromatophore cells allow them to change the skin color helping in crypsis (camouflage). They have a sharp beak for chewing crustaceans and fishes. Viperfish, great white sharks, and larger octopuses prey upon coconut octopuses. Their conservation status has not been evaluated by the IUCN. Due to their short and long-term memory, they are considered one of the most intelligent creatures. Male coconut octopuses often die right after the mating while females die out of starvation as they do not eat anything during the entire brooding period. They are the only invertebrates capable of using tools as armors and for egg laying. The ratio between their body and brain is exactly like mammals and birds. Their suckers have an illuminated appearance for which they are also known as blue glowing coconut octopus; but in reality, they are not bioluminescent.